I made my last school lunch this year. (The twins graduated high school in May.) By my reckoning, if I made sandwiches for their lunches every school day (180 days a year)* from K–12, times two kids, times two slices of bread, it would be roughly 1,300 loaves of bread**or more than 9,000 slices. That is a lot of bread (both literally and figuratively), not to mention a lot of work for the Sandwich Maker- in-Chief. Fortunately, my task was made more efficient by Otto Rohwedder. Never heard of him? Well, you can toast his invention (also literally and figuratively!) and celebrate sliced bread. Bread, of course, has been ubiquitous at meal times for millennia, and the fourth Earl of Sandwich had the bread-and-filling lunchtime meal named after him by 1762, but the world would have to wait until the twentieth century for the convenience of pre-sliced bread. Rohwedder, a jeweler by trade, first developed the idea in 1912 and had a prototype by 1916. The invention was not without setbacks, however. A fire destroyed his model and the blueprints for the slicer, along with the factory that was going to produce the machines, in 1917. Unwilling to leave his idea half-baked, Rohwedder started from scratch. It would be ten years before he had enough dough to try again, but by November 1928, he had a patent (1867377) for the new slicer. The next problem was persuading bakers to try out his invention. They believed that sliced bread would dry out faster than the whole loaf and that people wouldn’t want to buy pre-sliced loaves. Undeterred, Rohwedder figured out a way to wrap the bread to prevent rapid drying (and to keep the sliced loaf together), and he finally convinced a baker friend, M. Frank Bench, owner of the Chillicothe Baking Company in Chillicothe, Missouri, to try the machine. 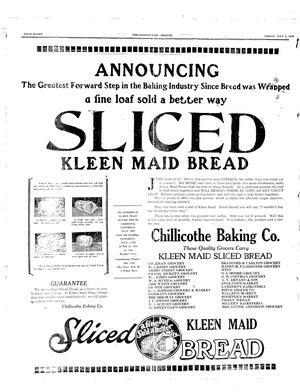 The first loaf of sliced Kleen Maid Bread hit the shelf on July 7, 1928—only 85 years ago this week! To Bench’s surprise, the pre-sliced bread was a hit. The Chillicothe Baking Company quickly saw their bread sales jump 2,000 percent. Rohwedder soon sold more of the machines, including one to a baker in the St. Louis area, Gustav Papendick, who made a few improvements of his own to the wrapping process; Papendick also receiving patents for his contributions. (Early attempts to keep the sliced bread together included pins or rubber bands!) Finally, the Continental Baking Company (which would eventually become Hostess Brands) took sliced bread national when they introduced pre-sliced Wonder Bread in 1930. Pre-sliced bread became so popular that in 1943 housewives even took umbrage when the government deemed the automated slicing process to be detrimental to the war effort and briefly banned the slicing (for the general public, although the military still used sliced bread to feed the soldiers) during World War II. Fortunately for sandwich makers everywhere, the ban only lasted about three months. With sliced bread sales rising, the sales of spreads, including jams, jellies, and peanut butter, also skyrocketed, and the pop-up electric toaster for home use (also patented in the 1920s) was suddenly popular because the uniform bread slices made the toaster less frustrating to use. Pre-sliced bread, first marketed as “The Greatest Forward Step in the Baking Industry Since Bread was Wrapped,” soon became the gold standard by which all other inventions were judged. With thousands of inventions in the last 85 years, different people may argue that the computer or the compact disc or the Chia Pet is the best thing since sliced bread, but sliced bread will be remembered as THE invention to beat. Chew on that the next time you reach for a slice. *Full disclosure: They only took sandwiches half the time, and prior to the picky middle school years, they often ate cafeteria food, but we are imagining here. **Loaves of the only brand of bread sandwich bread my kids like—minus the heels, which they don’t—make seven, two-slice sandwiches. The City of Chillicothe, Missouri, has an extensive history website with many pages devoted to sliced bread. Check out their poster, history page, and recent bread news, in particular. “Sliced Bread Put Back on Sale; Housewives’ Thumbs Safe Again; Wickard Rescinds Ban of Jan. 18, Saying Supply of Wax Paper Has Risen and Savings to Bakers Were Scant.” New York Times. March 9, 1943, 16. “Who Made That Sliced Bread?” New York Times Magazine. March 1, 2013. Wenske, Paul. “History of Sliced Bread Little Known on 75th Anniversary.” Kansas City Star. July 28, 2003 (archived article). On a Personal Note: Thank you for your patience with Curiosity Seldom Pays. This spring has been quite eventful with family mishaps and happenings, but life is returning to normal. Thus, I hope to return to a more regular blogging schedule.